Predicted increases in seawater temperatures accelerate coral reef decline due to mortality by heat-driven coral bleaching. Alteration of the natural nutrient environment of reef corals reduces tolerance of corals to heat and light stress and thus will exacerbate impacts of global warming on reefs. Still, many reefs demonstrate remarkable regeneration from past stress events. 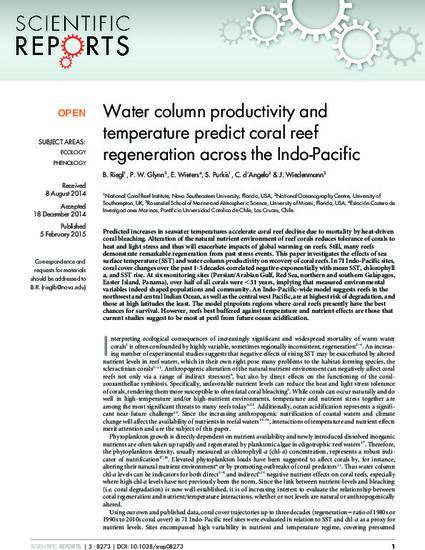 This paper investigates the effects of sea surface temperature (SST) and water column productivity on recovery of coral reefs. In 71 Indo-Pacific sites, coral cover changes over the past 1-3 decades correlated negative-exponentially with mean SST, chlorophyll a, and SST rise. At six monitoring sites (Persian/Arabian Gulf, Red Sea, northern and southern Galapagos, Easter Island, Panama), over half of all corals were <31 years, implying that measured environmental variables indeed shaped populations and community. An Indo-Pacific-wide model suggests reefs in the northwest and central Indian Ocean, as well as the central west Pacific, are at highest risk of degradation, and those at high latitudes the least. The model pinpoints regions where coral reefs presently have the best chances for survival. However, reefs best buffered against temperature and nutrient effects are those that current studies suggest to be most at peril from future ocean acidification.